Major cities in Andhra Pradesh, including those in the capital region, contribute only 25% to the Gross Domestic Product (GDP) of the state – a far cry from cities like Hyderabad and Bangalore that contribute 70% and 61% to the GDPs of their states respectively. 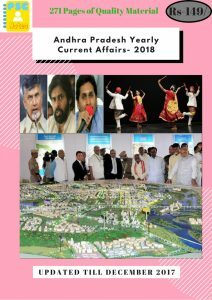 An internal analysis of the Capital Region Development Authority (CRDA) says Vijayawada and Guntur, which fall under the capital region, contribute only 5% each to the state. CRDA conducted this analysis to assert the needs of the new capital that can contribute to the economic growth of the state. According to the analysis, top capitals that contribute a lion’s share of GDP to their states are Mumbai (60%), Kolkata (50%), Ahmedabad (36%) and Chennai (35%) and are also major growth engines. China bans imports from N. Korea. China will halt iron, iron ore and seafood imports from North Korea, following through on new UN sanctions after U.S. pressure for Beijing to strong arm Pyongyang over its ally’s nuclear programme. China, which is suspected of failing to enforce past UN measures, accounts for 90% of North Korea’s trade. China and Nepal signed three agreement to further boost their ties in power, energy and economic sectors. The agreements signed cover oil and gas resources exploration, economic and technological cooperation and promotion of investment. Prime Minister Narendra Modi launches website to Honour Gallantry Award Winners. ð Prime Minister Narendra Modi launched a website to honor all the gallantry award winners since Independence. ð The portal will preserve and tell the stories of bravest men and women, civilians as well as armed forces personnel. ð The website gives details of the Chakra Series awardees i.e., Param Vir Chakra, Maha Vir Chakra, Vir Chakra, Ashok Chakra, Kirti Chakra and Shaurya Chakra. The portal contains information such as name, unit, year, citations and photographs of awardees till date. Prime Minister Narendra Modi launched New India movementfrom 2017-2022, a Sankalp Se Siddhi (Attainment through Resolve) Program was organized at Coimbatore. The New India Movement 2017-2022 organized an India free of Poverty, Corruption, Terrorism, Communalism, Casteism, and Un-cleanliness. New Delhi doubled the import tax on crude palm oils to 15 percent and raised the import tax on refined palm oils to 25 percent, increasing the differential in duty by 10 percentage points to encourage local processing. The government also raised the import tax on crude soyoil to 17.5 percent from 12.5 percent previously. Centre spends about $10 billion a year to import palm oil from Malaysia and Indonesia and relatively smaller quantities of soyoil from Brazil and Argentina. Large inventories and lower prices have fomented a wave of protests by farmers in the big agrarian states of Maharashtra and Madhya Pradesh. Nearly two-thirds of India’s 1.3 billion people depend on agriculture to scrape a living. Indian Oil Buys First Shale Oil from United States. State-owned Indian Oil Corporation (IOC) brought the country’s first shale oil from the United States of America and is looking to step up imports from America as part of its crude diversification strategy. IOC bought 1.9 million barrels of US crude in its second import tender seeking oil from the America. India, the world’s third-largest oil importer, joins Asian countries like South Korea, Japan, and China to buy US crude after production cuts by Organization of the Petroleum Exporting Countries (OPEC) drove up prices of Middle East heavy-sour crude, or grades with a high sulphur content.